Federal Bank will be the official banker for the one-dayer and tickets (Rs. 300 for upper tier, Rs. 500 to Rs. 2000 for second tier chairs, Rs. 1000 for lower tier chairs and Rs. 3000 for its premium seats and Rs. 5000 for special air-conditioned box) will be sold through the bank counters. For students, ladies and club members, the upper tier tickets will be available at Rs. 200. 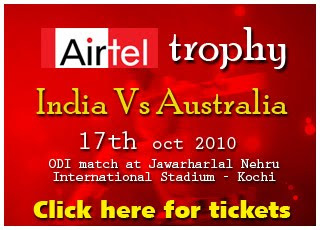 The Indian and Australian teams are expected to reach Kochi on October 14.